A casement is a window that is attached to its frame by one or more hinges. Casement windows are hinged at the side. (Windows hinged at the top are referred to as awning windows. Ones hinged at the bottom are called hoppers.) They are used singly or in pairs within a common frame, in which case they are hinged on the outside. Casement windows are often held open using a casement stay. In the UK, casement windows were the most common house window before the sash window was introduced, and usually contained leaded glass—glass panes held in place with strips of lead (called lead "cames"; leaded glass is not to be confused with lead glass, which refers to the manufacture of the glass itself). These casement windows usually were hinged on the side, and opened inward. The windows were covered by functional exterior shutters, which opened outward. Variants of casement windows are still the norm in many European countries, such as Denmark and Sweden. They are opened with a crank, lever, or cam handle, which is placed around hand height or at the bottom and serves as a window lock. 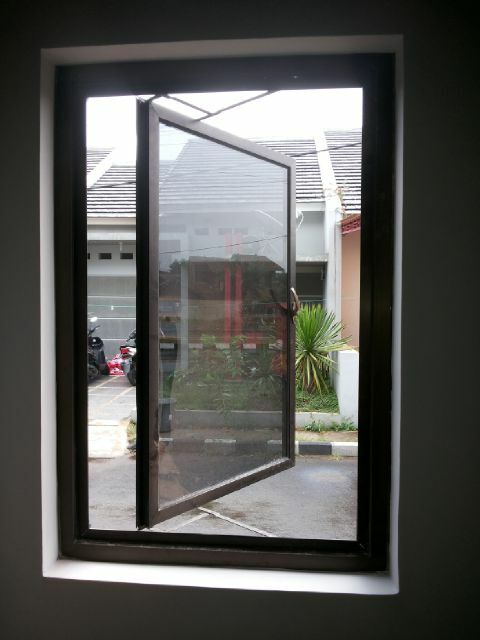 A crank, stay, or friction hinge is necessary when the window opens outward, to hold the window in position despite wind. Often the glass panes are set in a rabbeted frame and sealed with beveled putty or glazing compound to secure the glass.